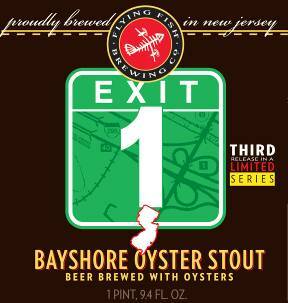 CHERRY HILL, NJ – On Wednesday, October 28, New Jersey’s largest craft brewery, Flying Fish Brewing Company (1940 Olney Avenue, 856-489-0061), will release Exit 1 Bayshore Oyster Stout, the third in their wildly popular Exit Series of Big Bottle Beers. Exit 1 is a classic oyster stout, a once-ubiquitous style brewed with local oysters, in this case from the Delaware Bay, for richness and intensity of flavor. Exit 1 is brewed with 100 Delaware Bay oysters per batch, lending their mellow ocean flavor and one-of-a-kind creaminess to the brew and resulting in a beer that is rich, soft and of course, a perfect complement to a plate of oysters. The beer bears the name of Exit 1 because it is the final turnpike exit before drivers enter the state of Delaware. Future Exit Series Big Bottles will be named for other exits, chosen based on videos, photos and testimonials submitted to Flying Fish by fans at www.exitseries.com. This series will continue, with three or four beers a year, to eventually encompass all turnpike exits. Exit 1 is available only during this one-time release, and only until it sells out across New Jersey, Pennsylvania and Delaware. A fanciful tribute to the New Jersey Turnpike and all the Garden State has to offer, these special brews are Flying Fish’s first foray into large bottles. The first and second in the series, Exit 4 and Exit 11, are already sold out, and ideas for future exits pour in daily through their Web site. Two Exit 1 Release Parties will be held on Wednesday, October 28. From 6 p.m. to 8 p.m., the Oyster House (1516 Sansom Street, 215-567-7683) will have Exit 1 on draft and will be offering $1 oysters and from 7 p.m. to 9 p.m, Standard Tap (901 North 2nd Street, 215-238-0630), will be pouring the first firkin of Exit 1. For those who wish to purchase Exit 1 bottles, both Philadelphia locations of The Foodery (837 North 2nd Street, 21-238-6077 and 324 South 10th Street, 215-928-1111) will also debut bottles of Exit 1 the same day. Flying Fish was the world’s first ‘virtual’ microbrewery, establishing an Internet presence as early as 1995. That presence helped to generate press interest and woo investors to the fledgling brewery, which would not open for business until late 1996. Today, Muller and his team oversee four full-time styles, as well as a variety of seasonal beers. Their brews have been featured at the Great British Beer Festival, Oregon Brewers Festival and Canada’s Biere de Mondial Festival. They have won medals at the Great American Beer Festival, Real Ale Festival and the World Beer Championships, and are the only New Jersey brewery featured in Best American Beers. Flying Fish was recently named “Local Hero: Beverage Artisan of 2009” by Edible Jersey magazine. In addition, the brewery took home two medals at this year’s GABF, including a gold medal for Exit 4, which was also named “Best Belgian-Style Beer in America” by Men’s Journal. Share "Flying Fish Accounces Exit 1"